Bea Garcia is upset because her next door neighbor and very best friend in the world, Yvonne, has moved to Australia. To add insult to injury, a new family moves into Yvonne's house, and they have a horrible boy named Bert who makes fun of Bea, wrecks her cardboard box building, and is generally horrible. Bea and her brother Pablo try to ignore Bert as much as possible, but since he is also in her classroom at school, Bea struggles with putting up with him. On the bright side, Bea loves to draw, has a great dog, supportive family, and manages to make new friends at school. Strengths: This is a good choice for readers who like books like Lola Levine and Ivy and Bean. 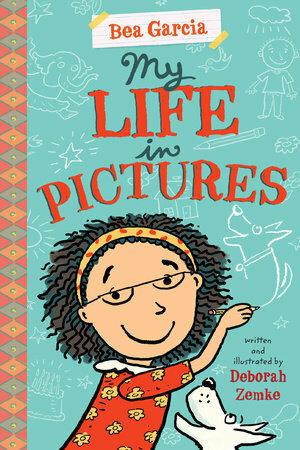 A sort of B is for Betsy vibe, which I always enjoy; a child with a clear (if misguided) interest; and a positive message about putting up with people one finds difficult make this a book I would have gladly handed to my children. Bea's Hispanic family background adds a bit of diversity as well. Weaknesses: I'd rather children be encouraged to like science and math rather than art, Bea never really makes peace with Bert (although that is certainly realistic), and I would have liked a few more details about Bea's cultural background. What I really think: This is too young for middle school, but I would definitely purchase this for an elementary library.